Blue, the Misfit Covered The Spread This Week. This weekend marks the Dallas Observer's annual Music Awards Showcase, which is a big deal if only due to the fact that damn near every band playing in Deep Ellum this Saturday is doing so as part of the publication's festivities. And, yup, it's a big sucker this year, too, involving nine venues and some 60-plus bands, including damn near everyone in this week's Buzz Rankings. So we'll try to keep things short and sweet this week. Perhaps the biggest benefactor of the aforementioned DOMAs is none other than Blue, the Misfit, who also scored the publication's cover story this week. 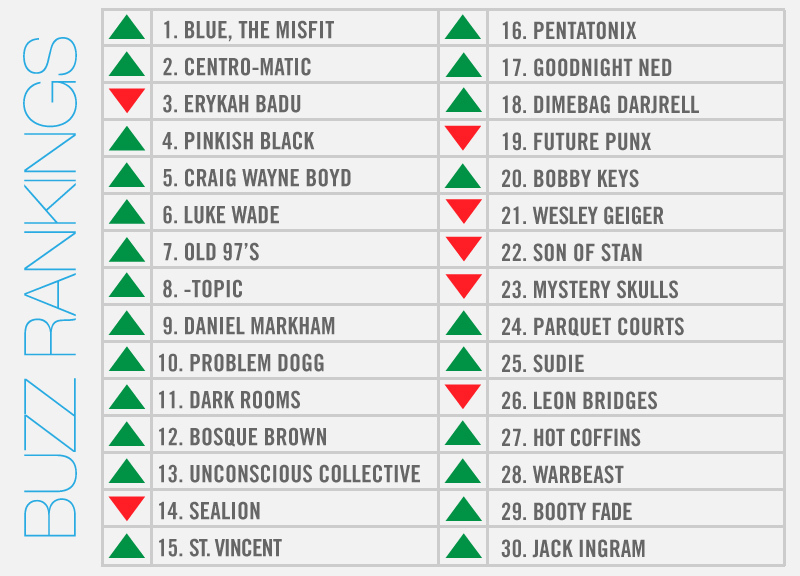 It's also one of the biggest reasons he tops our weekly local music power rankings for his second time. Some the artists playing non-Observer affiliated shows that either just happened or are yet to come include: Jack Ingram, who is taking part in a free holiday concert at AT&T Performing Arts Center; Erykah Badu, who who dazzled a packed house at The Prophet Bar at last week's Thanksgiving Eve show; Bosque Brown, which will make a rare live appearance to promote its latest EP; and Centro-matic, which turned in its last-ever Dallas performance earlier this week at the Kessler. Then there's the few dozen artists that recently released new holiday tunes, and Denton's Hot Coffins, which released a new LP earlier this week. Elsewhere: Craig Wayne Boyd became the last [local] man standing on The Voice; St. Vincent, Parquet Courts and Old 97's each showed up on year-end lists, Rhett Miller opened up to Marc Maron on the WTF podcast; and legendary sax man Bobby Keys passed away.